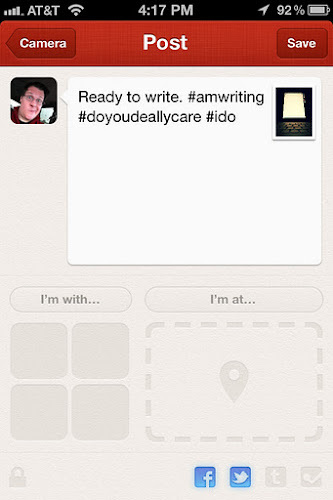 With the launch of Path2.0 last December, I discovered a new love. Many tools have come out that allow one to crosspost to Twitter and Facebook, but they all felt a bit kludgy to me. 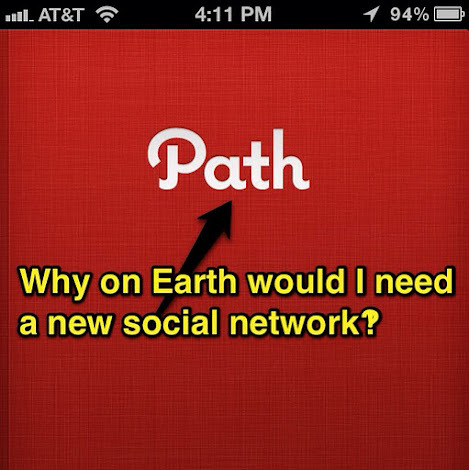 Path had elegance and style, plus some flashy "Gee whiz!" features I absolutely loved. The need to share feeds has been strong since Twitter came on the scene in 2006. After all, who has time to visit each social network? What? You do it anyway? Yeah, me, too. But we shouldn't. Haven't you heard? Time is precious. There are many very stable and convenient ways to crosspost. Selective Tweets allows us to post to Twitter and share to Facebook with the simple #fb hashtag, but it steals four characters. Hootsuite is powerful but as user friendly as a Doc Smith's mind reading helmet. Better were tools like Twittelator that had a friendlier, more iPhone-like style. But all of them had one flaw for my ADHD brain: They were full fledged Twitter clients. Sure I could crosspost. I could also read everyone's feed, click on links, chat with friends, look at pictures, &c. They were great for Twitter usage, but lousy if you wanted to diminish distractions. Path lets you crosspost to Twitter, Facebook, Tumblr, and Foursquare but doesn't pull in those feeds. This is important because sometimes we want to still share what we are doing with others, but can't afford the time to be sucked into what they are doing. I realize this seems counter to what social networking is all about, but since I seem to be so weak willed, I really enjoy having my cake and eating it, too. Type out a comment and tap on the networks you wish to share it with. As you can see from the graphic above, you can link other friends to your post, include your location, and even include a picture—all at once. I love it. Something about Path's interface makes it more journalesque for me. In fact, I find it a more intimate experience than Twitter or Facebook. All users' paths are private by default, unlike Facebook or Twitter. You must request friendship to be allowed into their world. They will think twice before letting you in because once they do, your world is shared with them as well. Path will show you who has seen your posts by silently adding their avatar in the emoticon menu, and they don't have to leave a comment. They can smile, wink, or express shock with a simple tap. The only loud aspect to this process is that you will be alerted to their comment in the iOS alert menu. Tap on the Plus symbol at the bottom left corner and a slick animated menu opens up, giving you access to photo, friend, place, music, thoughts, or sleep sharing. Sharing music is perhaps the best implementation of it that I have seen, even better than Apple's built-in iTunes sharing on Twitter. Path will query your iPod or iPhone to hear what you are listening to, then offer you various versions of it to share with your followers. I find it seamless and use it often. Wait. Did You Say Sleep Sharing!? This is my favorite feature of Path. I can mark when I retire to bed and when I wake up. Since I am an insomniac, I have been using this to share my horrid sleep schedule and (lack of) progress at mastering my insomnia with my daughter. It makes me feel responsible to her and take managing my insomnia more seriously. 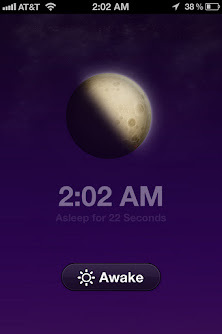 Activating sleep mode cuts off access to the rest of Path. You see a running counter under the current time which is under an accurate depiction of the Moon's current phase. 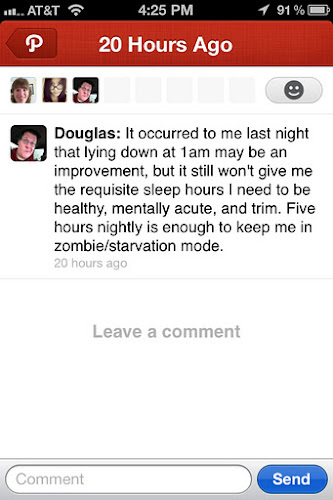 Tap Awake when you are finished pretending to sleep, and Path posts an estimate of how long you were "asleep", along with a glib comment depending on how long you pretended. There is more to Path than I've covered, from commenting on folks' posts to just leaving quick emoticons to mark your notice. 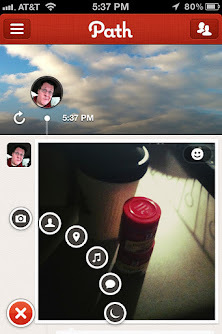 I probably didn't emphasize enough how gorgeous the interface is and how much fun taking photos with the app is. I wish it let me shoot in square format and crossposted to Instagram. That would be a big time saver for me. However, the main focus today was to emphasize how useful this app has been in cutting out the distracting clutter while still allowing me to participate in social networks. When I'm done with being productive, I can always load up a Facebook or Twitter app and respond to people's comments there, but during the crunch time I am able to avoid those sites with their wonderfully distracting babble. I highly recommend Path for those who want a stable, slick app to merely broadcast to social networks, or for those who want a more artistic social network that seems to encourage creativity and intimacy. The app is free, so give it a whirl and come on by.